Story by staff writer Betsy Villanella. Photos and video Copyright © Betsy Villanella. My husband had to go to Kansas City for his job, and I decided to join him. I have never been in KC during the holiday season and thought it would be fun to see the Christmas decorations and all their celebrations. I am not a city lover, but with all the lovely lights and everything festooned in evergreen and garlands, it’s a beautiful sight to behold. 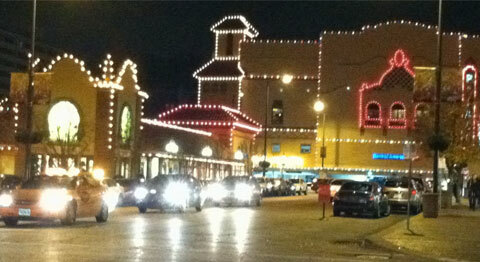 A 15-block section called the Country Club Plaza outlines all the buildings in Christmas lights for the season. 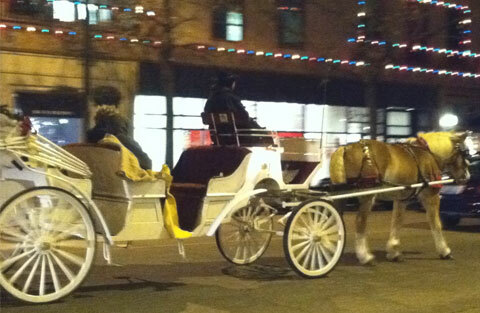 There are horse-drawn carriages, some of which are also lit up, and you can ride them for a tour of the Plaza. 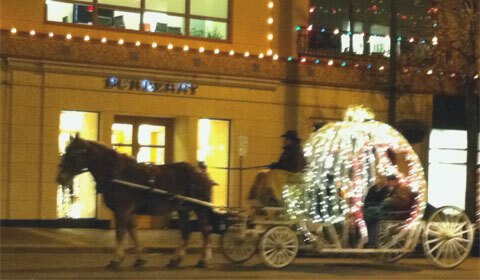 Just hearing the clip-clop of the horses’ hoofs as they stroll down the streets gives you a sense of holiday spirit. The Country Club Plaza, established in 1922 and designed architecturally after Seville, Spain, has over 150 shops and many nice restaurants. 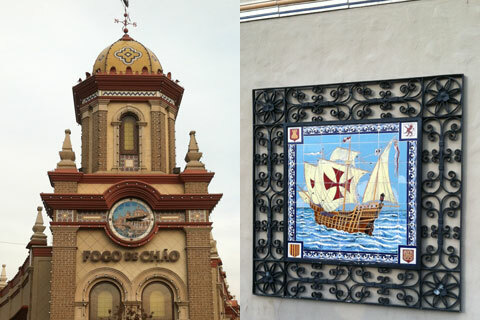 The buildings have a feel of the Old World in some places, with lots of tiled roofing and frescoes. KC is known as the “City Of Fountains” and I can see why. They are everywhere. There are more then 200 fountains in the city. It is commonly stated here that only Rome has more fountains. 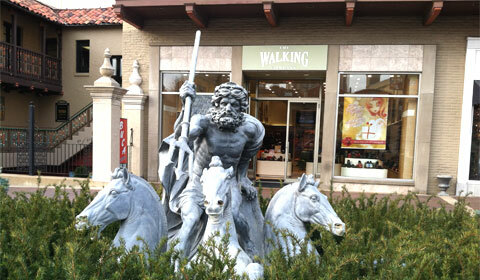 Too bad most are not running at this time of year, but the statues that the waters flow from and around are works of art. and the children of Mercy Hospital. Rub his nose, drop a coin." We stayed at the Sheraton Hotel in the Crown Center. 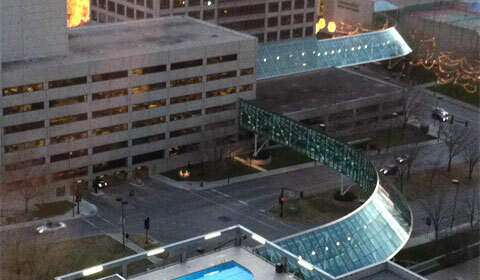 The Crown Center is named after the Hallmark Cards headquarters located here. 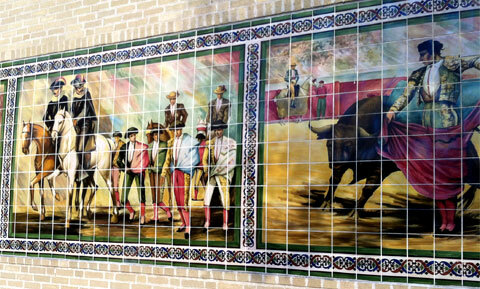 It is attached to the Crown Center shopping mall by what they call The Link: a glassed-in, tunnel-type walkway above the streets that winds around the area from the Sheraton to the Westin Hotel, through the shops, and then makes its way to historic and beautiful Union Station. The Link is climate controlled so no need for a coat. I have to admit I feel a bit like a hamster in it—it reminds me of a habit trail, and I keep finding myself on the lookout for a wheel to hop on. 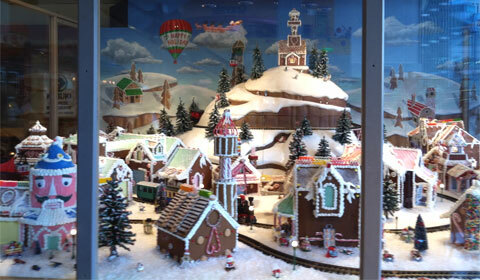 A large Christmas village of gingerbread houses with three trains running through was on display. All created by the chefs at the Westin Crown Center Hotel. 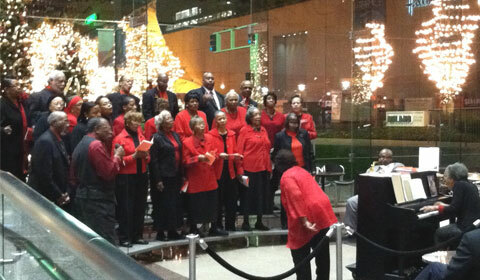 As I wandered the shops in Crown Center I was entertained by Christmas choirs of all ages. It was a pleasure to see them having such a good time singing for their families and passersby. • 49 water jets and 48 water shooters spout up to 60 feet in the air, before coming back to a 37,500-gallon underground reservoir. Water is recycled into the fountain at a rate of 2,200 gallons per minute. • Check out our dancing water shows, synchronized to music recorded for Crown Center by members of the Kansas City Symphony. The water show runs every hour on the hour, and it’s very entertaining to watch. The Crown Center Ice Terrace, a skating rink for the public to enjoy from November to March, is located here too. This is also where you can be awed by the 100-foot-tall Mayor’s Christmas Tree, one of the tallest in the nation. 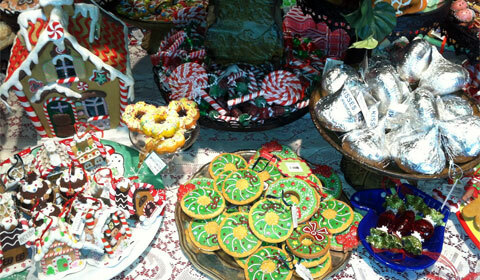 After the holidays the wood from the tree is turned into ornaments and sold the following year to help the city’s poor. This year’s ornament was “Holiday Mittens,” which I found was already sold out. Two interesting and inspiring places we visited while in KC: the National World War I Museum and (my personal favorite) the Nelson-Atkins Museum of Art. The war museum is a bit on the sobering side but very informative and really gives you a sense of the sacrifices of war. The art museum features paintings from well-known artists, such as Van Gogh, Monet, O’Keeffe, Remington and Rodin, just to name a few. It also displays ancient Roman and Egyptian artifacts dating as far back as the 3rd millennium BC. “From ancient times to modern day, this encyclopedic museum is one of the best in the country, offering visitors the opportunity to explore civilization through the eyes of painters, sculptors, craftsmen, and many other artists. If you’re looking for a great place for shopping and touring in the Midwest, Kansas City is well worth your time—not only for the Christmas season but for any season. I really enjoyed my time in this city. But I will admit that, after ten days away from my loved ones, I felt as a famous character from this area once said: “There’s no place like home.” I will be very happy to get back to spend Christmastime in mine. I wish you a wonderful Christmas with your loved ones, and please enjoy a prosperous and peaceful New Year!! WOW! I had no idea there was that much in Kansas City! I would never have considered it a place to tour…..and now it’s going on the list! I got a chucks whe you said you were looking for the wheel! It looks like you had GREAT fun! Thanks for the introduction to a mid-western gem! Dang! Sorry about the typos…..I missed them and the puppy is distracting me with her extreme cuteness! I really like your article. 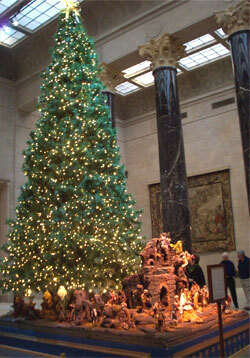 Who would have known Kansas City would be a destination for Christmas? Looks like fun! They had quite a bit going on for Christmas. The lights at the plaza were especially beautiful…my pictures don’t do them justice. I loved the article, and the pictures as well. WOW~ so much to do and so beautiful too! I really enjoyed reading your article and the pictures are great! Thanks for sharing! It was a fun place to visit. Plenty of great photo ops too! 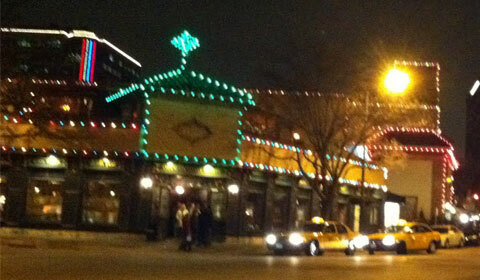 One of the most special things I remember about KC is the Country Club Plaza at Christmastime. The Plaza all lit up is just breath-taking. It was surely the talk of the town (and suburbs). It was a big to-do if you were going to the Plaza to shop or have dinner. I left KC just when Crown Center was being built around 1975. KC is the city of fountains; there are a lot of them there! I enjoyed the video of the fountain in your article. That one has been built since I lived there now decades ago. Thank you for sharing this story and pictures and bringing back so many wonderful memories! 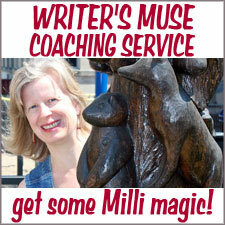 It is my pleasure that you enjoyed my article and to bring happy memories back to you! The plaza lights will certainly be one for me. It was a fun time and a new experience, I am glad to have had. Hey Betsy, awesome article! 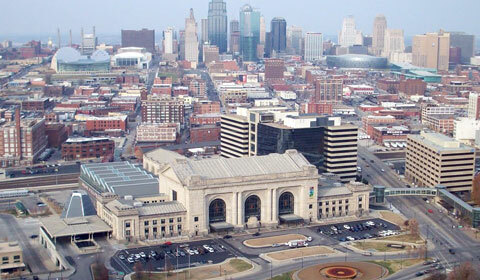 I enjoyed learning more about KC and looking at your marvelous pictures! I guess Samantha Brown better watch out! I am glad you enjoyed my article, and pictures. I loved reading about KC. You are the next Samantha Brown!!! Id be happy just to have a fraction of her audience. Thanks for the nice comments. Kansas City, had a lot more then I thought Id find to enjoy. I am glad I was able to go and see their Christmas celebrations. Wow! Kansas City really looks great! I love the children choirs I hope I can visit this country soon. I have visited it once but I haven’t seen this beauty. Is this new to the city? This is the first time I was able to go and see Kansas City’s Christmas time, so I am not sure if everything was new or a tradition, but I am sure there is a bit of both. 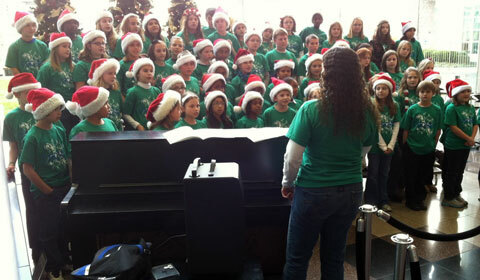 The bus loads of Children from schools all around the state, came to sing at the Crown Center, the weeks leading up to Christmas. Also many church choirs. I am so glad you were able to see our country, and hope you can come again. This country has more beauty, then one could experience in a lifetime. I am sure it is the same for all over the world. This is the reason I love to travel. I am doing my best to see as much as I can. I love Kansas City but I love Daisy Felecio! lol! Kansas City has a lot to offer. Sights, culture, great food. Not sure who Daisy Felecio is, but I’m sure she would be happy to know you love her. lol. Thanks for reading my article and the nice comment. Lovely post Betsy, looks like you packed in a lot of sightseeing in the time you were there. 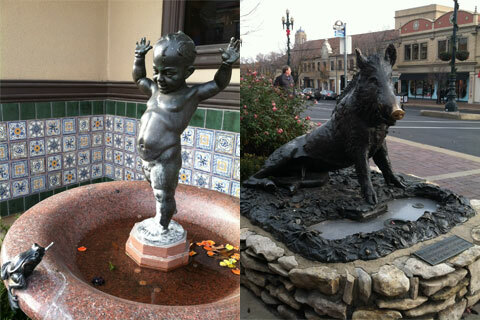 I loved the boar fountain, with his wish rubbed nose, and the water show was wicked. That boars nose was so shiny.. LOL I admit I made my wish! I think the lights were my favorite part of the trip, but all those cute kids were a close second! Hi, Betsy! Thanks for taking us on this tour of Kansas City. 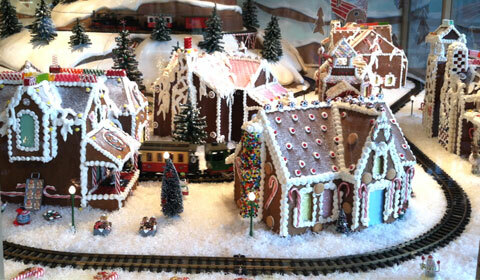 It sure looks like they know how to do Christmas! I particularly liked the way the buildings were lit up in Country Club Plaza; there’s something about a whole bunch of lights that’s uplifting. Glad to hear you are home now, though, and hopefully enjoying the season with your family and friends. All best wishes to you! I am glad to say my tree is up and the house is now draped in Christmas finery. 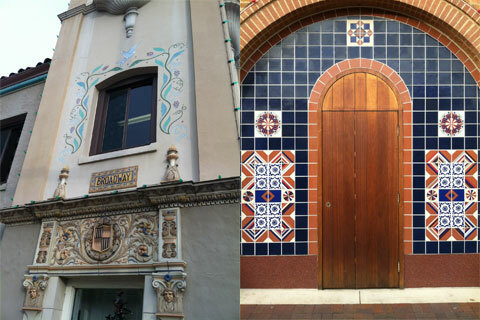 The horse drawn carriages look like something right out of a fairy tale, the (Spanish influenced) architecture is wonderful and the children’s choir are adorable! It was a very enjoyable trip for me. Which was a surprise because it was just a business trip for my husband. KC is a beautiful city, and Id love to visit it when all the lovely fountains are running. 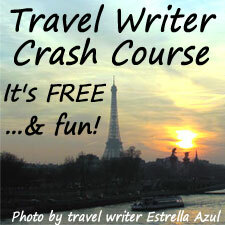 I have found another place I would like to visit, thanks to you!! Thanks! KC is a great place to visit at Christmas time. I never would have thought it, unless I went. There was so much to do and see. I liked the carriage sounds a lot too.